These light, sweet meringues are so easy to make, and a fantastic way to decorate cakes and cupcakes! 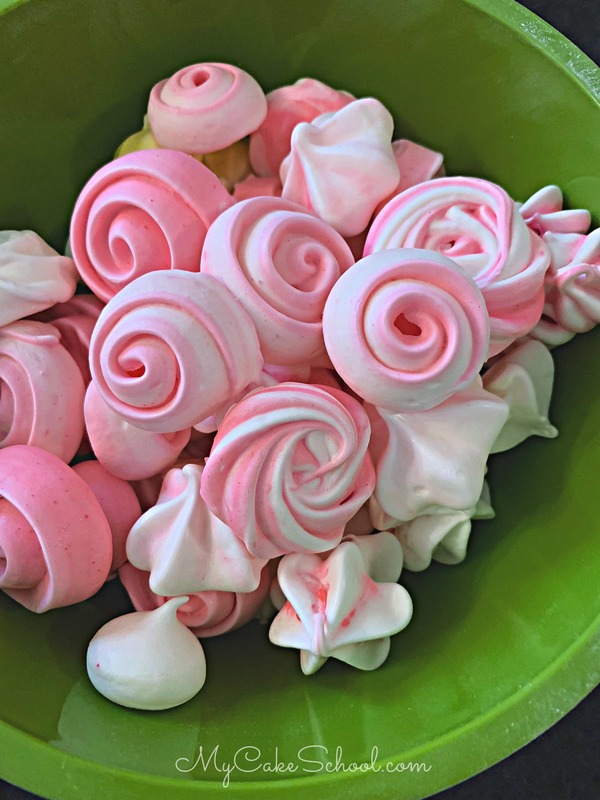 This recipe for meringues is so simple, and I love their delicate appearance, especially when their shapes are piped! The options are endless when it comes to decorating meringues. The meringue can easily be tinted, piped through a piping bag with all sorts of piping tips from french and star tips to round tips and petal tips. 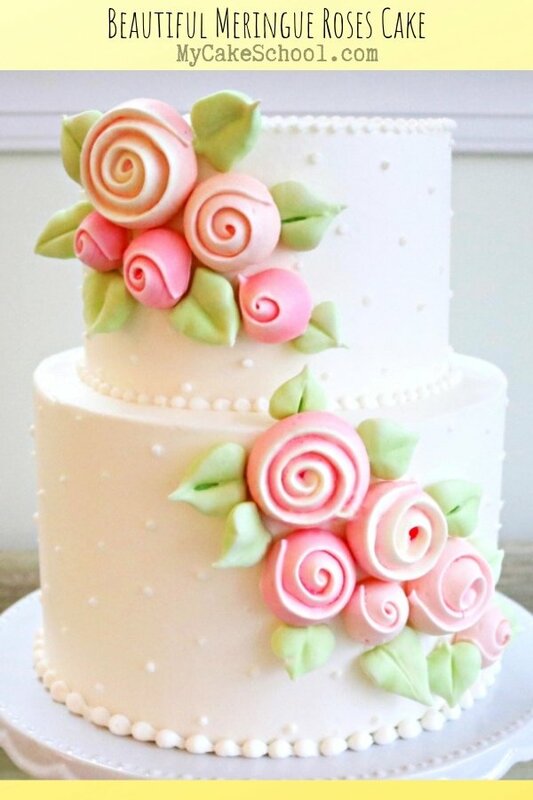 Whether you are piping ribbon roses roses, billowy meringue kisses, or simple stars, meringues are certain to take your cakes and cupcakes to another level! You can find many recipes for meringues online and all are fairly similar. However, the recipe that we’re sharing today is our FAVORITE! These meringues are light and crisp on the outside, and soft and slightly chewy in the center. We’ve tried recipes in the past that had a subtle yet noticeably bitter aftertaste from cream of tartar or meringue powder. Perhaps it was the brand that we were using, but we decided to experiment with this recipe as it does not contain cream of tartar. I’ve made this recipe several times now, always with good results! We started with egg whites which we whipped using an electric mixer and whisk attachment until foamy soft peaks formed. Next, we slowly added our sugar and vanilla and continued to beat until stiff peaks had formed. Then, we tinted our meringue and baked at 175 degrees F for two hours. We then turned off the oven, leaving the meringues inside for another hour as they continued to cool. We’ve created meringues for a couple of cakes in our Member Cake Video Tutorial Section. 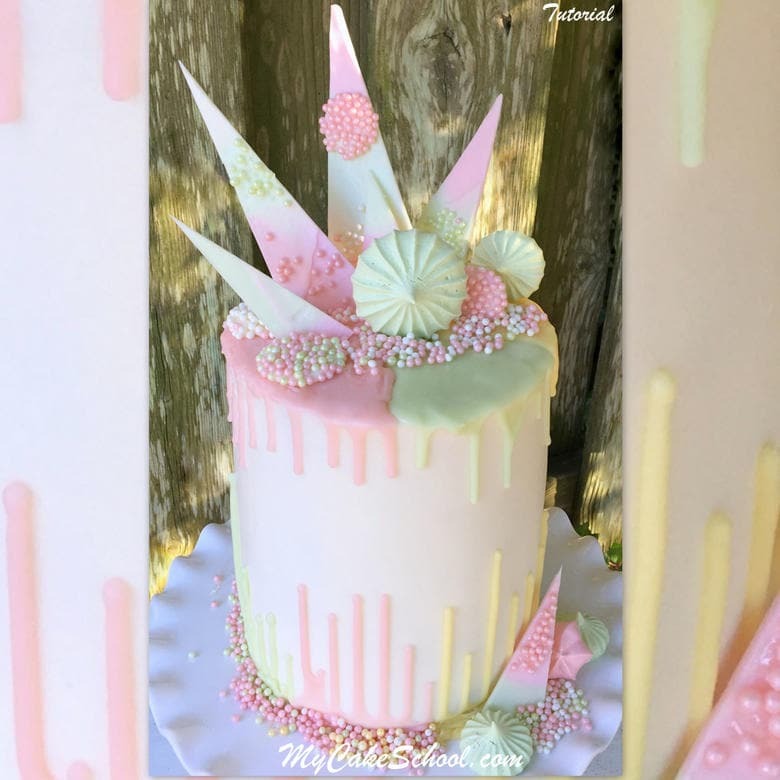 In our Pastel Drip Cake featured below, we created pastel meringues to add beauty as well as added dimension and color! Meringues are more difficult to make in humid climates. Rainy days or even steam from running dishwashers can cause the meringue not to whip up properly. You must bake your meringues on the lowest rack of your oven to prevent browning. We use clear vanilla in our meringues as real vanilla can give an off-white tint to the cookies. If meringues are baked at a heat that is too high, they are more likely to brown. My recipe calls for baking at 175 F. When I baked at 200, my meringues had more of an ivory or cream-colored tint. Thanks for stopping by! Don’t miss our full collection of favorite cake, cupcake, and frosting recipes in our Recipes Section! 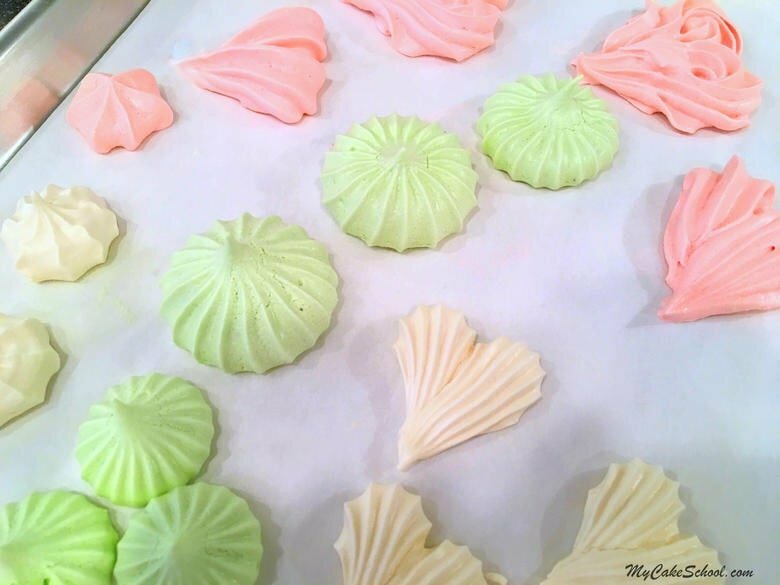 These Meringue Cookies are delightfully light and sweet, and make the cutest decorations for cakes and cupcakes! ¾ cup super fine sugar - if you do not have this you can make your own by processing granulated sugar in a food processor or bullet blender. It is very important that your mixing bowl & whisk attachment/beaters are completely clean & free of grease so that the egg whites whip up properly. In your mixing bowl, beat the egg whites & salt at medium speed (using whisk attachment) until foamy and soft peaks form (about 50 seconds). Gradually add sugar and vanilla while mixing at medium-high speed until stiff peaks form. Gently fold in powdered sugar until incorporated. If you wish to tint your meringues, gently fold in your color. Pipe the desired shapes onto parchment-lined cookie sheet. Bake for 2 hours (lower rack of the oven) or until meringues are dry and easily moved. Turn oven off but leave the pan in the oven for an additional hour to cool. Once they are completely cooled, store in an airtight container away from strong lighting or sunlight. 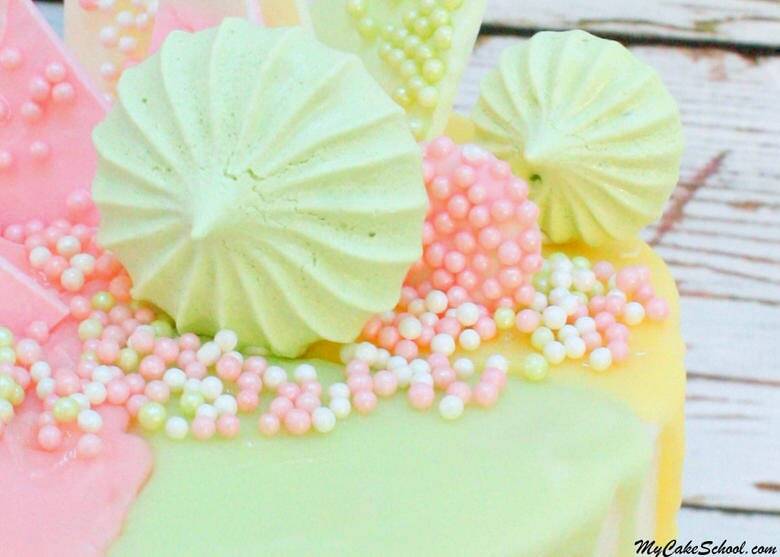 Light could cause the colored meringues to fade. Meringues can be kept at room temperature in an airtight container for 3 weeks, or longer in the freezer. I used a bit of powdered strawberry jello-beat it in with the sugar-smelled lovely, perfect pink for Valentines! Perfect for our Tea Party! Good idea, Bonnie!! I’m happy to hear that worked! Thanks for posting! 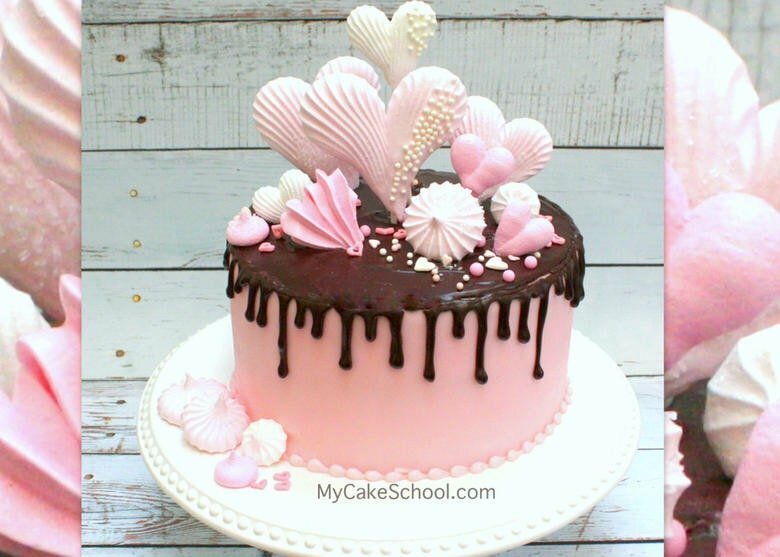 Looking forward to trying these for several Valentine cakes I am doing for an auction coming up.. How far in advance can I make these and store them? Thanks so much! Hi DeAnna, We have kept them for 3 weeks. Once they are completely cooled, store in an airtight container away from strong lighting or sunlight. Light could cause the colored meringues to fade. Thanks so much Bebe for the info and quick reply… I really appreciate it and love the tutorials…I have learned so much in just a short while from them!